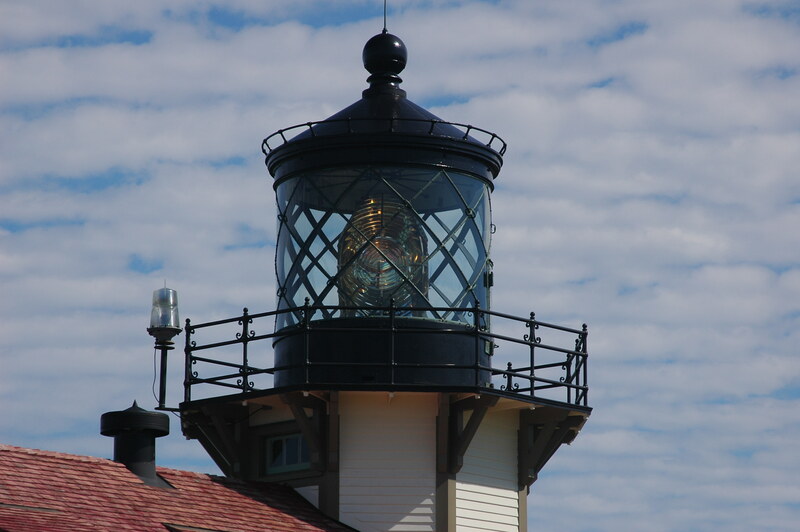 Saturday is your last opportunity this season to tour the restored 3rd order Fresnel lens. Once you ascend the stairs and emerge onto the platform, it’s hard to remember that you’re on the lens tour. The view from this vantage point is like none other. Once you catch your breath, turn around and fix your gaze on the magnificent lantern that, even today, acts as a guiding light for ships cruising the California coast. Learn more about the history of the station and the people who lived here on the Point Cabrillo website. This is a family-friendly activity, but children must be at least 42 inches tall to go on the tour. There is a ½ mile walk to the lighthouse from the parking area. The College of the Redwood Community Chorus is giving its Spring Concerts on Friday, May 13 at 7 pm, and again on Saturday, May 14 at 2 pm. Both concerts are in the sanctuary of 150-year-old Mendocino Presbyterian Church, which is on the National Register of Historic Buildings. 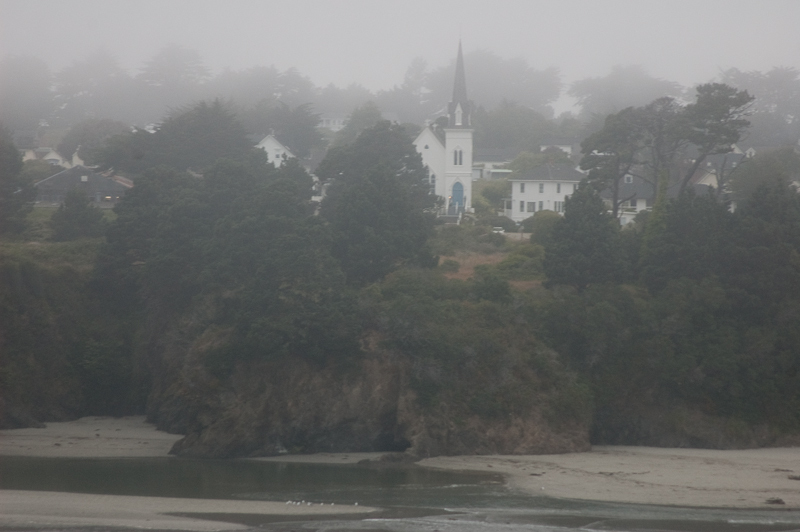 Mendocino Presbyterian Church Looms over Big River Beach in the Fog. The Church is on the National Historic Register, and has wonderful acoustics for singing. Having sung in the sanctuary many times now, it’s a wonderful place to enjoy music for an hour — the acoustics are absolutely fabulous, and the choir is sounding great! The program includes Mozart’s Te Deum, written when he was 16. There’s a fun (and challenging) song by P.D.Q. Bach (1807-1742), and others by Dvorak and Sibelius. They are also performing a challenging number called “Daemon Irrepit Callidus” by Gyorgy Orban. It’s one of those pieces where you will either love it or hate it, but you will admire the choir for tackling it. All in all, there’s a nice variety of music. The choir will be joined by the Mendocino Brass Ensemble on the final number, and the Trebl’d Women will also be performing. The Kelley House Museum’s historic walking tours will also take you by the church if you just want to see this lovely old building. They are doing tours this weekend as part of Heritage Days, which runs through the end of May. On Sunday, the walking tour will visit the 150-year-old Masonic Temple in Mendocino. If you’ve ever been to Mendocino, it’s the building with the large white statue on top called Father Time and the Maiden. The tour takes you inside the temple, and you are allowed to take pictures. Heritage Days in Full Swing! (You can also see the post author in the glass)Heritage Days of Mendocino County is in full swing now during all of May! This is the eighth year for Heritage Days—Nancy and I started it back when we were part of the now defunct Mendocino Business Association. Over the years, more organizations have joined the effort, including a number of inland partners in Willits and Ukiah. Organizers include: the Kelley House Museum • Ford House Visitor Center • Guest House Museum • Point Cabrillo Light Station SHP • Mendocino Coast Botanical Gardens • Mendocino Study Club • Mendocino County Museum & Native Daughters of the Golden West. 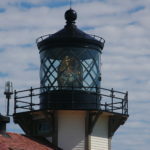 Events this year include touring the third-order Fresnel lens at Point Cabrillo; tours of Ridgewood Ranch (home of Seabiscuit); historic walking tours in Mendocino, Fort Bragg, Willits, and Ukiah; lectures by historians; cemetery walks, and more. You can see the full schedule on the Heritage Days Web site.